Lynn Schaufler wasn’t trying to save the world, just to give her daughters Samantha and Stefanie some professional help with their singing. But when she picked out Kay Pere as a voice coach five years ago, it started a chain of events which led to four Westerly Middle School teens performing for Bill Pere’s LUNCH Ensemble, an organization dedicated to raising funds and awareness in the fight against hunger. “Bill heard us singing, and asked us to join,” Samantha said. 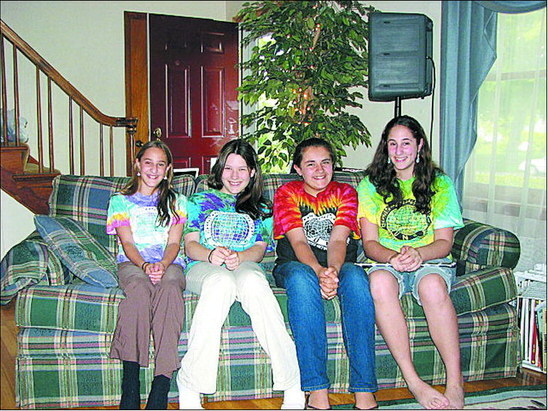 The Schauflers and their friends Grace Cordio and Danielle O’Farrell have had fun, benefited from profes­sional instruction, and worked to make a difference with the singing group, made up primarily of young people from southeastern Connecticut. And on Friday, June 1 the ensemble will per­form at one of its biggest shows, the Tribute to Harry Chapin at the Shubert Theater in New Haven, featuring the Steve Chapin Band. Harry Chapin’s music and dedication to ending hunger inspired Pere, and he combines the popular singer’s message and works with his own to address a continuing problem. LUNCH, the Local United Network to Combat Hunger, performs across Connecticut and increasingly in Rhode Island, as well as occasionally as far as California or Canada. Pere, a professional singer and songwriter and a Connecticut State Troubadour, started the organization in 1989 and holds practices and recording sessions at his Mystic home. He and Kay, his wife, also operate the Connecticut Songwriting Academy. “These are the kids who are going to be the adults of tomorrow’s world and hopefully they can learn from these things, and then go and do a better job where a better job needs to be done,” Pere said. Chapin said a performer should always do one show for themselves, and one for others. By teaming together for a good cause, the ensemble members can go even further. “Bill always says to do all our shows for the other person,” said Samantha, an eighth-grader. That’s not a problem, at least for these teens, because they find it enjoyable. After all, this is a volunteer group. Anyone can join, and that at times includes both experienced vocalists and shy kids who want to give it a try. Lynn Schaufler said she was impressed with how students with diabetes or Tourette Syndrome became accepted as part of the group, and how shy kids blossomed. “He breaks the ice for the kids very well,” said Joy Cordio, Grace’s mother. His personality is a big part of what drives the effort, but it’s a personality hard to capture in words. “ You can’t really explain Bill,” said Stefanie, a seventh- grader. audiences, that means props and improv and tie-dye T­shirts. The also team up with local students, including at Stonington High, Pine Point and Wheeler. The Westerly members enjoyed their recent concert at Bradford Elementary. “ We were performing in front of people we knew, and it was exciting for us,” Samantha said. There’s also fun after practice, which is two or three nights a week for several weeks before each concert. “It has to be fun. I like fun, I’m just a big kid,” Pere said. will be a special event for the LUNCH members, especially the older ones, Pere said. What you see at a particular show will depend on what the audience is like, so any two shows may be completely different. “If they saw us at a kids’ show, we’d be hyper. At this concert, we’ll be more profes­sional,” Grace said. Samantha and Stefanie have been in the group for five years, including performing at everywhere from the Shubert to a campground in the rain. “It’s a lot more fun with a variety,” Samantha said. In addition to practice, pointers and a chance to be in the recording studio in the Pere home, there are opportunities to learn new instruments. Samantha is learning the drums to perform at concerts, while Stefanie has already played the guitar. There are many solo opportunities, too. For one song, Danielle sings a part in French. Pere said that he tries to give everyone a chance to shine this way, and it adds to the group’s variety. Even outside of LUNCH, there are influences from being part of the group. Grace used one of Bill’s songs in a talent show. Stefanie read one of the songs aloud for a public speaking contest, using the crayon props from the song “Flowers are Red,” which are passed around during LUNCH performances. The song is about a teacher explaining how to color. The lyrics and messages of the songs are not lost on the ensemble members. “Every lesson, he’ll tell us a fact, so we learn more,” Samantha said. There are several dozen agencies that have been aided by LUNCH, including numer­ous community organizations like the Jonnycake Center. “Now people are aware of what we do in Westerly, and they want to join. I know a few Bradford students want to be involved,” Samantha said. Pere said one Bradford student will be joining the ensemble in time for the New Haven performance.